New Jersey residents ranked drinking water quality as the highest environmental concern, and they want elected officials to prioritize water infrastructure improvements and investments. 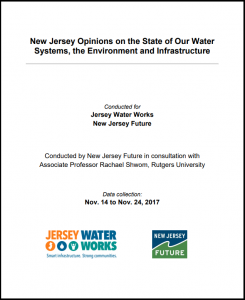 New Jersey Future and Jersey Water Works conducted a survey of 1,175 New Jersey residents in November 2017 to get a baseline assessment of what they know and don’t know about the state of our water systems and what their concerns and priorities are about water, the environment and infrastructure. New Jerseyans ranked protecting our drinking water as their most important environmental concern and believe securing clean, safe drinking water should be the top environmental priority for the new governor and Legislature. 92 percent of New Jersey residents believe ensuring all people have safe drinking water should be a priority for the legislature and governor. Jersey Water Works is cultivating stakeholders to promote just and sustainable water infrastructure solutions that resolve their cities’ water infrastructure problems and also provide broader community benefits. The survey results give Jersey Water Works a baseline from which to gauge the results of its education and outreach efforts, which is one of the key priority solutions on which it will be working during 2018 and beyond. People Care About Water Infrastructure – Poll findings on the public’s concerns about their water systems, their willingness to pay for improvements, and the priority of elected officials. Why Water Infrastructure Matters to New Jersey – This fact sheet makes the case for investing in water infrastructure upgrades by outlining the economic, social, and environmental and public health benefits. Social Media Graphics – These infographics are designed to be shared via social media and deliver highlights from the 2018 community survey on water, infrastructure, and the environment. Survey: New Jersey Residents Name Clean Drinking Water as Top Environmental Priority – Blog post from JWW backbone staff.